One of the two aussie "copies" of the HRO. Made by Kingsley Radio, it is distinctive with its stainless steel front panel. Shown with its matching power supply and speaker panel. Also used by the Australian Army where it was known as the Reception Set No.1. The army version was fitted into a steel carrying case and the front panel painted green. Covers 50 kHz to 25 MHz utilizing 6 plug-in coil boxes. 455 kHz IF. 1st RF=6U7, 2nd RF=6U7, Mixer.Osc=6K8, 1st IF=6U7, 2nd IF=6U7, Det/AVC/AF amp=6G8, BFO=6C8 and AF output=6V6. 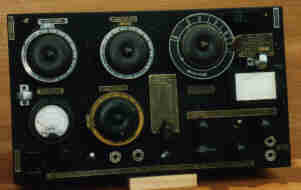 Made by Radio Corporation of Australia, very little is known about this receiver or its use. It is dry battery operated and appears to be a fairly comprehensive receiver incorporating crystal phasing. It covers the frequency range of 150 kHz to 16 MHz in 4 Bands. RF amp=1P5, Mixer/Osc=1A7, 1st IF=1P5, 2nd IF=1P5, Det/AF amp=1H5, BFO=1H5 and AF output=1A5. Made by AWA, this combination was the Australian counterpart of the British T1154/R1155 and the American SCR-287. In the photograph, the AR8 receiver is on the right, the AT5 transmitter in the centre, and on the left is it's Aerial Tuning Unit. AR8 Rx has two front ends, one for MF and one for HF. MF unit covers 140 kHz to 2 MHz. HF covers 2 to 20 MHz. IF is 755 kHz. Both units have a 6U7 as the RF amp and a 6A8 as the Mixer, HF Osc is 6V6 (later units had 6J5), 1st IF=6U7, 2nd IF=6U7, Det/AF amp=6G8, BFO=6A8, Limiter=6X5 and AF output=6J7. AT5 TX covers 140 to 500 kHz and 2 to 20 MHz continuous or Xtal channels. Power output up to 50 Watts CW and up to 17 Watts AM. MF section uses 807 as the M.O./Xtal Osc into the PA stage and the HF section uses a 6V6 as the M.O./Xtal Osc, 807 as a buffer/doubler into the PA stage which has 2 x 807's in parallel. 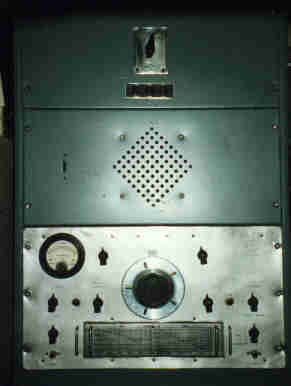 Another product of Radio Corporation of Australia, the ATR-2B was a transmitter/receiver for ground use, often used initially in control towers until a larger unit could be installed. This example still has the tower frequency marked in the card holder. Covers 3 to 7.5 MHz, AM/CW/MCW. 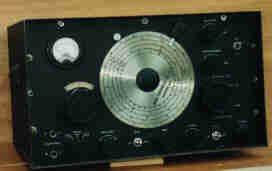 4 Xtal channels or Master Oscillator. Tx lineup is Osc=6F6, Modulator=807 and Power amp=807. Rx has 455 kHz IF.